Top Right: David Lee cradling a nice WILD rainbow trout at the boat on Toms Lake. Top Left: Awesome fishing at Hotnarko… one of Daniel’s bigger rainbows. Bottom Left: Discussing the finer points of fly rodding for WILD rainbow trout in the West Chilcotin. 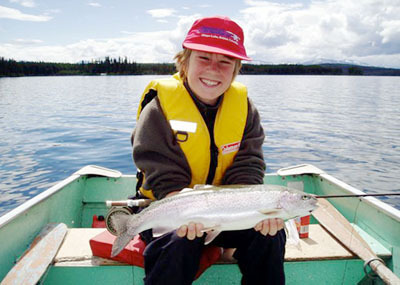 Bottom Right: Jordan Stewart, with a prime 17″ Davidson Lake rainbow. 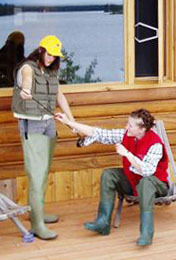 June into July 2003… the fishin’ action continues to be GREAT! – Casting flies to likely holding water on the Upper Dean and Blackwater rivers continued to produce good numbers of cuttbows and rainbow trout. – Jordan Stewart went fishing with mom and was rewarded with a prime 2 pound, 17 inch WILD rainbow trout from Davidson Lake, June 26/03… #6 silver bodied muddler was ‘the’ fly! 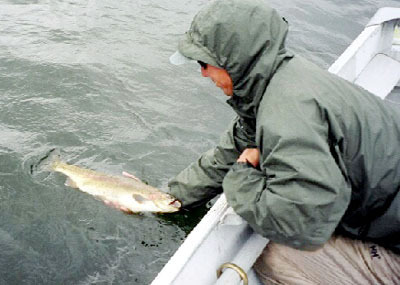 – Fishing at Nimpo Lake… still has its highlights if you get on the water at the right time, with the right fly. – David Lee and Tim Johnson enjoyed their time on the water at Toms Lake, with several nice WILD rainbows in hand. While the weather was overcast with rain from time-to-time, the fishing remained steady for David and Tim making for a pleasant trip. – The rewards of fishing for dollies… BIGGER fish on spinning gear or flies! – A family outing by the Stewarts to Hotnarko Lake on July 14/03 was a great refresher and break from the fast pace of a busy month. Daniel was into two fish that went 3+ pounds, Jordan helped with netting a 3 pound, 18 inch WILD rainbow… it was awesome fishing all day long! A #6 black woolly bugger with a copper rib was the ‘fly of choice’. 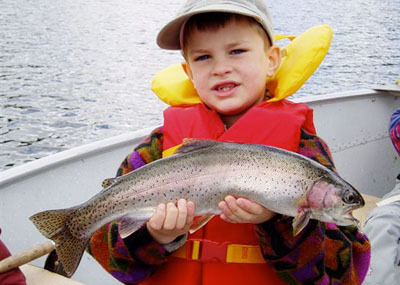 Stream and lake fishing continues to be evenly excellent as July ticks by, with the lakes continuing to please all fishers as we fish up in elevation due to rising summer temps. The size of trout caught has definitely picked up with bigger fish hammering the flies with gusto!